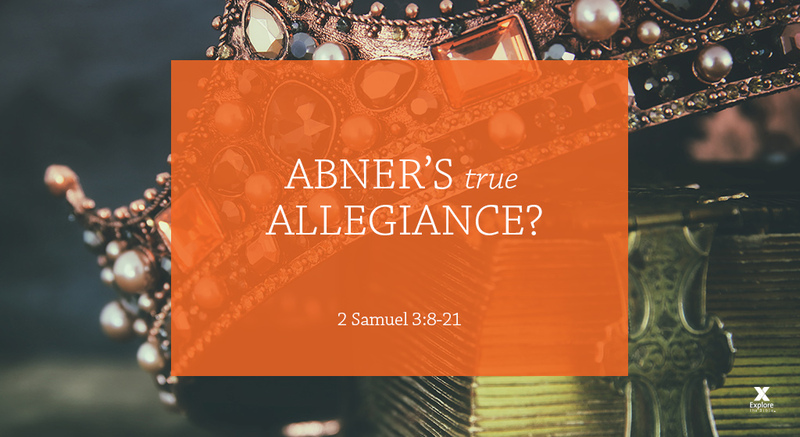 Abner slept with Saul’s concubine in order to strengthen his position within the house of Saul. When Ish-Bosheth questioned Abner, Abner get offended and defected to David’s side. David agreed to meet with Abner if he brought his first wife, Michal, daughter of Saul, with him. Abner agreed, and he immediately began building a coalition of elders and Benjamites to support David. Joab kills Abner for revenge for his brother’s death. When David finds out, he absolves himself of all wrongdoing and publicly weeps and condemns Joab for his actions. 9) Abner was questioned by Ish-Bosheth on why he slept with Saul’s concubine. Abner began building a coalition of elders and Benjamites to support David. He swore he would help establish David’s throne over all of Judah and Israel. 10) Personal Question. My answer: David asked essentially for proof that Abner was acting in faith by having him bring him his first wife, Michal. David welcomed him with a feast for him and his men. David gave Abner an opportunity to prove his loyalty. Joab, on the other hand, was blinded by revenge and would do anything to kill him. He immediately thinks Abner is out to deceive David, so he goes out and kills him. I try to respond with love and compassion, but it’s a battle all the way because I want to write them off and have nothing to do with them ever again. 11) Personal Question. My answer: God places men in David’s life to help him such as Abner. God changes Abner’s heart to David. It’s interesting how a little accusation blows up into something big enough to make Abner switch sides. We see how evil and unforgiving man is at heart when Joab murders Abner in cold blood. In David’s time, women were political symbols. Abner’s sleeping with Saul’s concubine would have suggested that he had his eyes on becoming king himself. Later, when Absalom drove his father David out of Jerusalem, he slept with David’s concubines in public, demonstrating to all eyes that he had taken over from his father (1 Sam 16:12). We aren’t specifically told, but Abner’s response leads us to believe that the accusation was false. It is possible that as he was strengthening his hold on the house of Saul he took the concubine as an expression of his power and dominance. It is more likely that because of Abner’s increasing power Ishbosheth felt it necessary to invent this accusation as a reason to get rid of Abner. If Abner knew that David was God’s choice for king, he had no good reason to fight against him before this. Abner is a good example of those of us who know things to be true, but who don’t live as if they were true. Abner did the right thing in joining David’s side, but he did it for the wrong reason. Instead of joining David because Ishbosheth offended him personally, he should have joined David because he knew that David was God’s choice to be king. David received Michal in marriage (1 Samuel 18:26-28), but Saul took her away to spite David (1 Samuel 25:44). 1 Samuel 18:20-30 describes how David used this unusual payment instead of a dowry for the right to marry the daughter of King Saul. Why did David want Michal back? David may have still loved her. David wanted to show that he harbored no bitterness towards Saul’s house, and he would show this through his good treatment of Saul’s daughter. David wanted to give himself a greater claim to Saul’s throne as his son-in-law. Though he was the rightful king, David would not reign over Israel until the elders submitted to him freely. He never moved an inch without an invitation. How does King David reflect Jesus? Jesus and David were prophesied, but only the remnant and the few accepted them. Until both are accepted, nothing is set in stone. David and Jesus must be invited in. Why did Joab murder Abner? Joab carefully engineered this murder because the killing was done outside the gate of Hebron , which wasa city of refuge (Joshua 20:7). It was against the law for Joab to kill Abner inside the city. Why did David renounce this murder so strongly? The murder of Abner set a bad precedent. The murder of Abner made it harder for David to win the rest of Israel over to his side. Why was Joab not punished for the murder of Abner? David still believed vengeance belongs to the Lord. This was just one mess David would deal with, and, as king, these messes are commonplace when running a country since men are sinners inherently. Thanks for these insights. This had been one of those court intrigues that simply hadn’t made much sense to me before this.